After months of #crossiscoming hashtags, #crossisfinallyhere for the Wisconsin Cycling Association Cyclocross series. 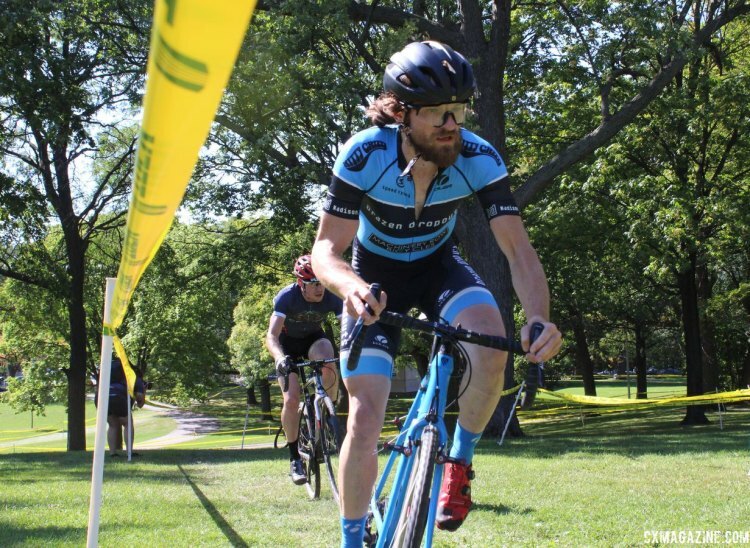 Yes, there was that relay last week, but the racing started for real on Saturday with Cross Shooshko at Kosciuszko Park in Milwaukee. Last year’s event brought some weird weather early in the morning, but in 2017, racers could not have asked for a more perfect day with the sun shining and temperatures near 75 degrees. The race is named for the venue where it has been held each year since 2014. Kosciuszko Park (pronounced Shooshko) is named in honor of Tadeusz Kosciuszko, a Polish military commander who assisted the Americans in the Revolutionary War. 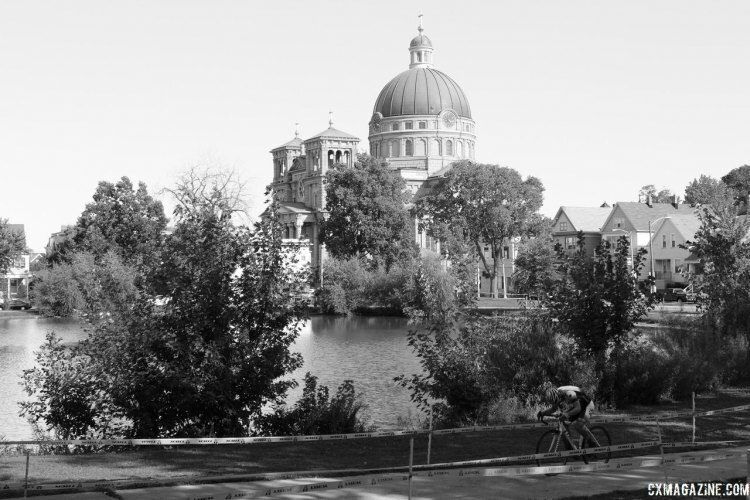 Also nearby is the impressive Basilica of St. Josephat, which towers over a corner of the park. Kosciuszko Park is a grassy, shady park with a small hill running through the middle of the grounds. The 2017 race was the fourth anniversary of the event, and organizers have continued to improve the course year after year. 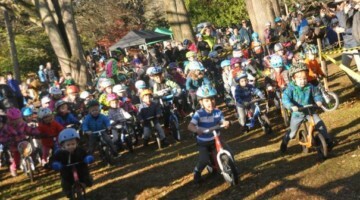 Although the iconic alleyway start and trip through a resident’s back yard are gone, the organizers have added a tricky section of off-cambers and several trips up the hill through the park. Last season, defending Masters 35-39 national champion Sydney Guagliardo (Psimet) headed north from her Barrington, Illinois home to start her memorable cyclocross season with an impromptu border battle at Cross Shooshko. She looked to determined to repeat her victory from the opening whistle by blasting off and creating a gap back to the field during the holeshot. Guagliardo’s fast start would be short lived, however, as she lost traction early in the first lap and allowed the rest of the field to erase her fast start. 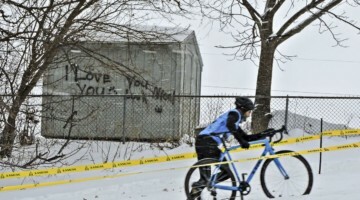 Halfway through the first lap, Guagliardo’s teammate Kelli Richter (Psimet) and Abby Strigel (unattached), who was making her return to cyclocross after a cameo appearance at the Wisconsin State Championships, put in an effort and got out ahead of the field. Perhaps because it was early in the season and riders were just feeling each other out, the early efforts by the Psimetters and Strigel came back and after the first lap a group of five that included Guagliardo, Erin Feldhausen (Trek Midwest), April Beard (Trek Midwest), Strigel and Richter formed as the riders headed out for the second lap. The first selection at Cross Shooshko happened early in lap two as the riders made their way to the southeast corner of the park near the iconic Basilica of St. Josephat and then to the series of flowy corners onto and down the hill. When the riders reached the barriers manned by Jo van Deraffe, Feldhausen and Guagliardo had opened up a five-second lead on Beard, who in turn had nearly ten seconds on Strigel. During the third of five laps, Feldhausen’s bizarre training regimen of early-summer running (Geoff Proctor would be proud) started to pay off when she began to pull away from Guagliardo. 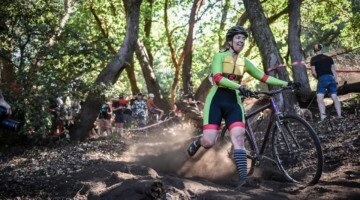 Her lead was just four seconds at the end of three laps, but she continued to ride smoothly and use the climbing skills she displayed at Cross the Isthmus last season to quickly get up the ascents. 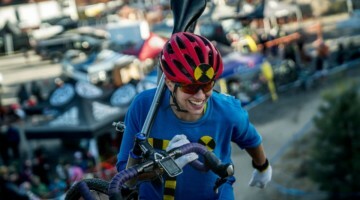 For Feldhausen, pedaling through the corners and maintaining speed was her key to her initial move. 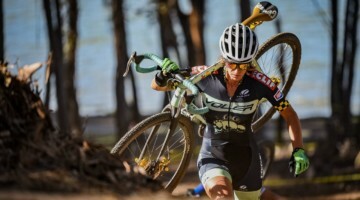 “I kind of stuck behind for the first lap or so and then figured out where I was going to be stronger through the turns, and that was kind of kind of the biggest thing, knowing where I could pedal through,” she said. Feldhausen’s smooth riding paid off, and her lead swelled to over 15 seconds as the race’s last two laps played out. 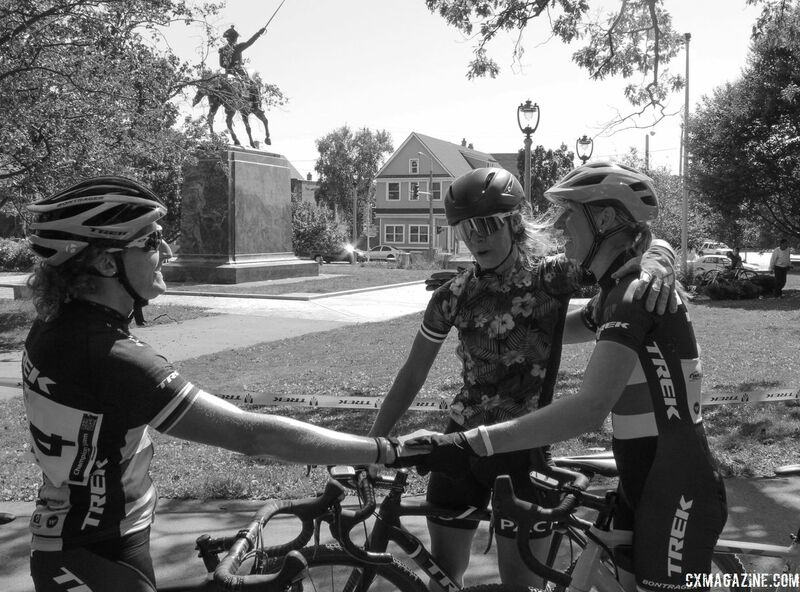 She came across the finish line to grab a victory for her Trek Midwest team and to deny the Illinois guests their second-straight border battle victory. Guagliardo stretched her lead on Beard and took home a second-place finish for the afternoon. Beard kept her fellow Trek employee Strigel at bay and took home the third spot on the podium. 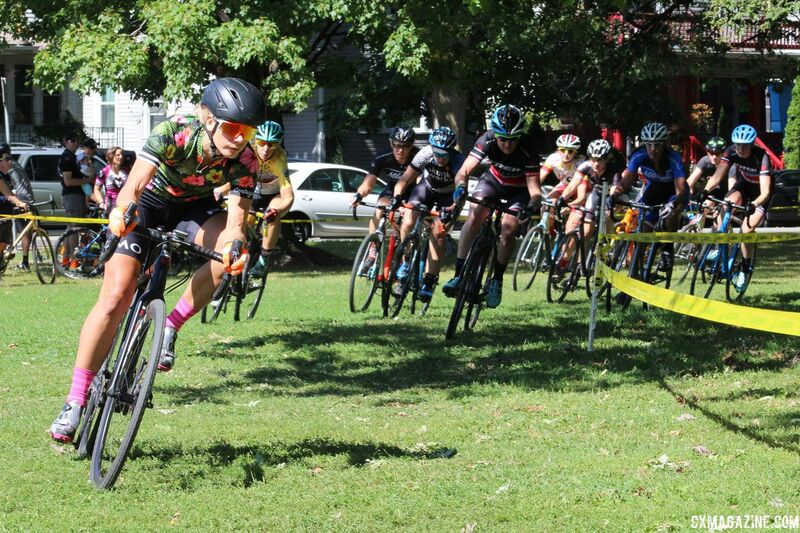 Strigel finished the afternoon in fourth and Julie Phelps (Gryphon Velo Racing) took fifth. 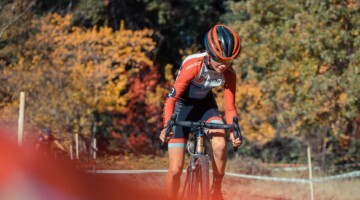 After the race, Guagliardo said that her training for the cyclocross season started slowly, and she is looking forward to riding for fun until her Nationals-caliber fitness returns. Always one to enjoy riding the hills of Wisconsin, it would not be surprising to see her giving Feldhausen and others everything they can handle in due time. 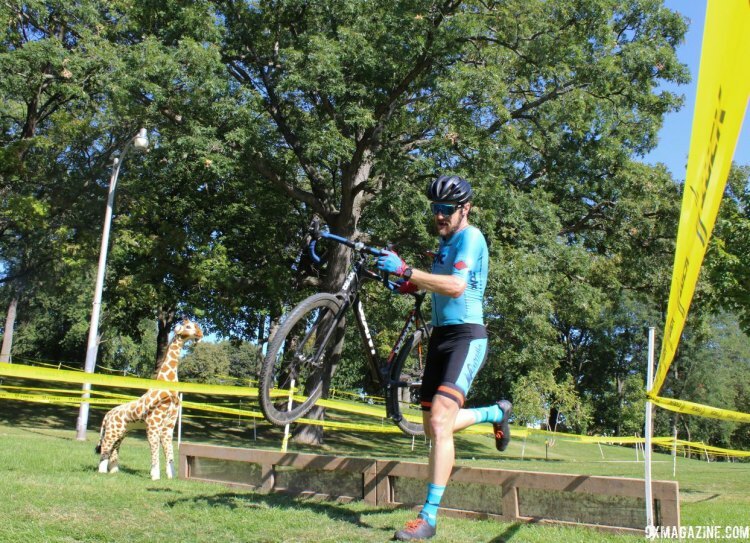 Defending Baby Masters and singlespeed national champion Isaac Neff had an impressive season of racing cyclocross in Wisconsin in 2016. Neff won five of the eight races he did on Wisconsin soil, and the losses came against Wout van Aert, Brian Matter and Steve Chainel. Needless to say, not bad company to lose to. On Saturday, Neff returned to the cyclocross course after a strong mountain bike season, albeit with a slightly different challenge. One of the keys to Neff’s success in Hartford was the skill of his mechanic: himself. Neff recently started Neff Cycle Service, a mobile bike shop, and in 2017, NCS is serving as neutral support for WCA Cyclocross. For Neff, this meant working the neutral support pit for much of the day and then kitting up to race mid-afternoon. One reason the 2016 season was memorable for Wisconsin cyclocross was the sheer amount of talent that toed the line along with Neff in the Men’s Elite races. In 2017, there are some questions about who will be around to challenge Neff’s supremacy. Dan “The Hamburglar” Teaters will be missing the 2017 season due to health issues, Worlds team member Caleb Swartz is off to college at Marian University in Indianapolis and Brian Matter has taken up full-time residence in Arizona and will not be around Wisconsin very much. That said, there was still a healthy amount of talent on the line at Saturday’s race in Milwaukee. Fresh off his stint as a CrossFit model, Bryan Fosler (801 W. Madison) returned to his natural habitat, the Nicest Man in Cyclocross—and now, movie star—Kyle Russ is back to try to shake the top-podium-step monkey off his back, Al Krueger (Linear Sport / Trek) is stepping up to the Elites after dominating the Masters 35+ category last season and David Blodgett (Great Dane Velo Club) and Tyler Stein are going to geared bikes after their 2016 singlespeed success. On Saturday, Al Krueger blasted off the start line to take the holeshot and grab the coveted coffee holeshot prime. After Krueger’s fast start, the field spent much of the first lap feeling each other out, as might be expected for a season-opening race. Four different riders took a turn on the front during the first trip around the circuit, and after one lap, a group of seven riders was still together to head out for lap two. Anyone who followed the WisCXonsin Race Reports in 2016 knows that at some point, Isaac Neff is going to execute his famed “Pedal Hard” move, which involves, not surprisingly, pedaling hard. The only real questions are when is it going to happen? And can anyone effectively counter his effort? The large seven-rider group broke apart during the early stages of lap two, and Neff, Fosler and Russ broke off to form a lead selection. Neff’s move eventually came in the latter stages of lap two, and when he hit the barriers he had established a six-second gap back to Fosler. Fosler, whose road fitness fit the course’s power sections nicely, began to open up some space on Russ as well. 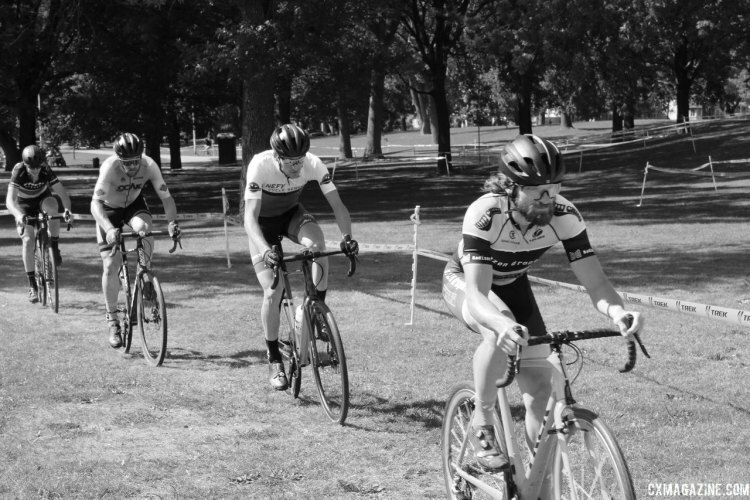 During this time, Krueger had an unfortunate run-in with the course tape, and the merry band of Cat 2s—Blodgett, Stein, Matt Riley (Team Wisconsin) and Jorian Giorno (unattached)—took his place chasing the lead trio. Neff’s lead was ten seconds at the start of the third lap, and at the start of lap four, his lead was over thirty seconds. Neff seamlessly navigated around the flowy corners while constantly staying on the gas. 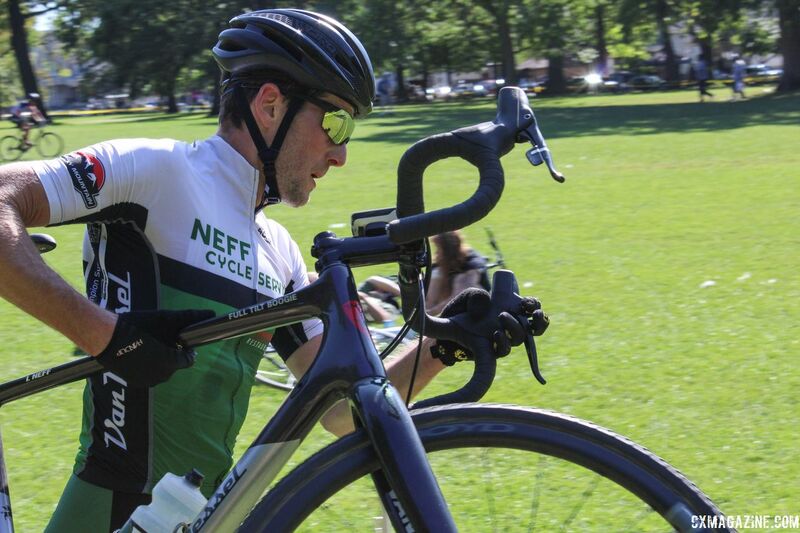 Neff has big goals on the horizon, including the iconic Chequamegon mountain bike epic this weekend and the Trek CX Cup next weekend, so he continued to press on knowing that his coach Brian Matter would be looking at his power data and asking him if he went hard for 60 minutes. Behind Neff, Fosler established his hold on second while Russ was caught in no-man’s land between Fosler and the hard-charging merry band of Cat 2s. During the fourth lap, Blodgett and Stein pulled away from Riley and Giorno and nearly closed the gap back to Russ. They soon made the catch when the riders headed out for the fifth lap. For the remainder of the race, Neff widened his lead on Fosler, who in turn, widened his lead on the group battling for third. Neff grabbed his first victory since his magical run in Hartford and Fosler took second. The battle for third in the Men’s Elite race was where the action was the remainder of the affair. After Stein and Blodgett made the catch, Stein pulled ahead of Russ and looked determined to assert his will on the group. Russ, however nice he might be off the cyclocross course, was having none of it, and he pulled back ahead as the riders approached the start/finish. Although maybe not as powerful as some of his competitors, Russ is a very smart and savvy rider, and on Saturday, those skills propelled him onto the podium. Russ took advantage of his handling skills through the more technical sections of the course to erase Stein’s lead and make his move to get away from his competitor who recently moved to Minnesota. Russ was able to make the attack stick and held Stein off to take third. Stein finished fourth and Blodgett fifth. Belgianwerkx rider, and newly-minted Cat 2, James Marshalek came on strong later in the race to take sixth. 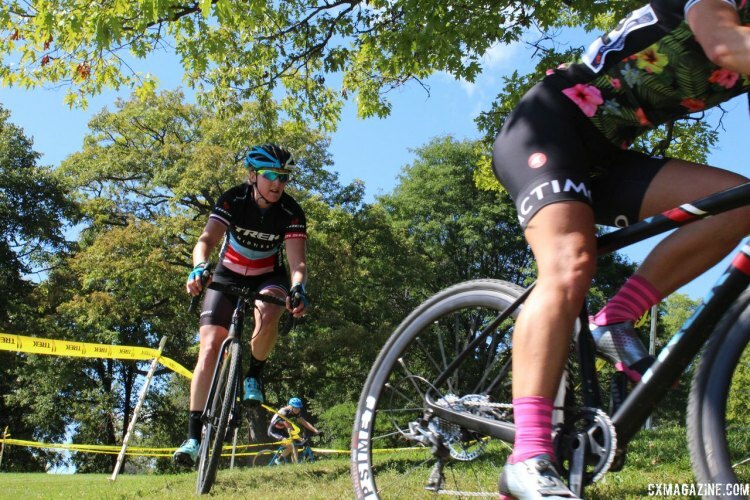 The WCA Cyclocross schedule now takes a break for the Jingle Cross Festival and Trek CX Cup and their accompanying World Cups. Many of the series’ riders will be making the trip to Iowa City and the Trek event, which is also the site of the state championships, is always popular with Wisconsin riders. The WCA schedule resumes in three weekends with the first two races of the new Hinterlands sub-series. Flyover Silver Creek in Manitowoc will be Saturday, September 30 and Cross of the North in Wausau is Sunday, October 1.